Throughout his highly-decorated playing career, Gordon Strachan was able to prove that size need not matter when it comes to achieving success on the pitch. 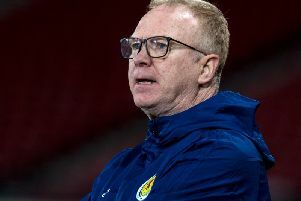 As Scotland manager, he now regards overcoming the physical disadvantages of his team as the biggest obstacle to leading his country back to a major tournament finals. and Denmark at Hampden on Tuesday night. But, as Strachan assessed the performances behind those scorelines, especially against the physically imposing Danes whom he conceded were the better side on the evening, he pinpointed the greatest difficulty facing Scotland in their bid to end a 20-year exile from international football’s top table. “We had the second smallest team, in terms of height, in the Euro 2016 qualifiers, other than Spain,” reflected Strachan, a man for whom the phrase ‘diminutive midfielder’ might have been specifically coined. “But you can forget about Spain, because they are magnificent [technically] and have the core strength that goes with it. Physically, we have to match teams because if we can do that, then we can play. When we play against different teams, we need different things. “When we play against a big team like Belgium or Denmark, we need more of a presence because otherwise they just knock you off the ball. So we need to look at that, but keep a passing ability in the side at the same time. If you play a low-level fixture, then the standard of passing we produced against Denmark on Tuesday would be fine. “But because the intensity of the game was high, then our passing went awry. It doesn’t mean we have to sacrifice the way we want to play – absolutely not. That doesn’t work. Strachan’s desire to bulk up his squad will ensure there remains a place in it for 35-year-old Brighton central defender Gordon Greer and powerful Derby County striker Chris Martin, both of whose contributions earned his approval on Tuesday. By handing debuts to the youthful trio of Celtic left-back Kieran Tierney, Hibs midfielder John McGinn and Nottingham Forest winger Oliver Burke, who all caught the eye during their time on the pitch against the Danes, Strachan illustrated his willingness to introduce fresh blood for the World Cup campaign which kicks off in September. But he is keen to temper the level of expectations surrounding the potential impact of the newcomers ahead of a testing group which sees Scotland face England, Slovakia, Slovenia, Lithuania and Malta. “Don’t get too excited for them,” warned Strachan. “They will only get their chance if they’re good enough, I’m not just going to fill up the squad with them. What we saw from the new caps is a bonus and that’s wonderful. “But Gordon Greer was just as outstanding as them on Tuesday, as was Craig Gordon in goal. Chris Martin also kept the ball up well when he came on. It might not be pretty, but it works. We also got Robert Snodgrass back against the Czechs, which is terrific for us. “It was a bit of a gamble to name two squads and change the team completely from Prague to the Denmark game. But I had to find things out. In management, you sometimes have to make decisions. But it worked for us everywhere, apart from the performance level we got on Tuesday night and, as I’ve said, I know why that was. Mentally, the younger players who played know they can handle it, so that’s no problem now. They just have to keep the physical side now. But they now know what is required when you play against top, top players. It’s about knowing where you have to push yourself to get a maximum. “They don’t need to ask fitness coaches or all those gurus or nutritionists. You ask the people who have been there. They’ll then find out they need to train harder than everybody else. They’ll be told ‘I put more into the game than anybody,”. That’s it. “I’ve seen players drink gallons of water and be rotten. I mean, seriously. But John and Kieran have humility as much as anything. I watched John with the under-21s and saw it. “I watched the ones who want to get better, the ones with humility but a bit of drive at the same time. Oliver Burke, too. He’s a quiet lad but what a determination he’s got. When he first walked in, I said ‘He can’t be Scottish, when he’s that size’”. In the absence of the ill David Marshall, who firmly established himself as Scotland’s first-choice goalkeeper during the Euro 2016 qualifying campaign, Strachan was especially gratified by the outstanding displays of Allan McGregor and Craig Gordon in keeping their respective clean sheets against the Czechs and Danes. “I never look at it as ‘who is number one?’,” he said. “Different goalies have different things and sometimes you need them for different games.